Traditionally, Indian marriage is almost performed as a grand festival; also foreigners love to get married in an Indian style. To make a hassle free task in relation to transport, we provide you all type of luxury cars. At Punjab Tourist, we have a great selection of wedding cars available and a range of offer to suit your requirements and budget. We can provide beautifully presented silver, black or white wedding cabs decorated with elegant bridal trimmings. 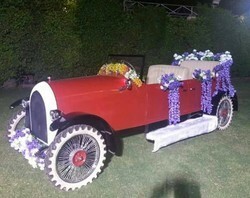 We can provide cars for weddings anywhere in Delhi. Our specialist fleet of wedding taxis includes silver and white wedding cars. Anmoltravels.com presents an enviable list of transportation providers with an exclusive range of limousines, imperial horse-drawn carriages to bus transportation. Let the wheels roll... it is your day. Make it special the way you want and ride off to a blissful future. Having a wedding is a huge step. On such a massively momentous day, you will want everything to go smoothly. By employing professional drivers, you are guaranteeing you not just show up in style, and impress all your attendees, but it also give a moment of surprise to your bride to love you more. 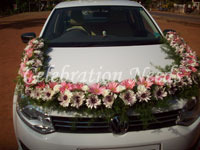 We provide wedding car decoration in DELHI NCR at very reasonable price. we are a leading and well known wedding car decorator in Jaipur, has long been associated with quality flowers & flower decorations on car. we are well known for the quality of the products and the service which we provide.